We’re hiring a new UK & Ireland Sales Executive! 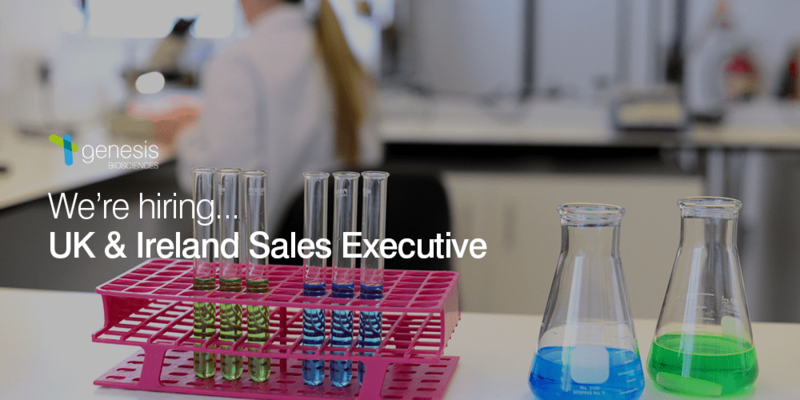 We are seeking a highly motivated individual to join our dynamic Cardiff-based team to play a key role in the sales development of Genesis Biosciences’ range of microbial and anti-microbial products, as our UK & Ireland Sales Executive. Meet the rest of the team, find out more about Genesis Biosciences or read the job description below to see if you’ll be a good fit for the role. Basic £25-35k (based on experience) + Excellent Commission, Car Allowance, Pension. The Sales Executive will service allocated existing accounts across the UK and Ireland, obtain orders and establish new accounts. The successful candidate will be a sales professional, with experience in selling technical products and solutions, (a successful track record in selling Chemical or Microbiological products into the facilities management and WWT markets would be advantageous) as well as having knowledge and experience in using Salesforce.com or another CRM system. We are looking for a highly driven, self-motivated and responsible individual, who is able to work a UK-wide field based role 3 days out of 5, with 2 days (typically Monday and Friday) based in our Cardiff office for administrative duties.